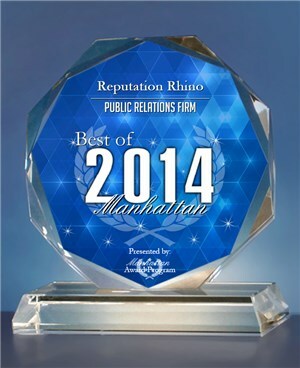 (PRLEAP.COM) August 15, 2014 - Reputation Rhino, a highly-rated online reputation management company in New York City, was recently awarded the Best of Manhattan Award for Public Relations. The Manhattan Award Program is an annual awards program honoring the achievements and accomplishments of local businesses throughout Manhattan. The Manhattan Award Program was established to recognize the best of local businesses in New York City. Recognition is given to those companies that have shown the ability to use their best practices and implemented programs to generate competitive advantages and long-term value for their clients and the community. "We are proud to receive the Best of Manhattan Award for Public Relations," says Todd William, founder and CEO of Reputation Rhino. "In today's world, it is important that clients know how seriously we take our commitment to excellence in online reputation management and public relations. On behalf our extraordinary team, we are excited to rank among the Best of Manhattan." Reputation Rhino is an online reputation management company and digital agency in New York City offering website design and development, search engine optimization (SEO) and Pay Per Click (PPC) marketing and online public relations solutions for individuals and business. For more information about Reputation Rhino, visit http://www.reputationrhino.com or call 888-975-3331.